Will the touch turn into an iPhone, the Classic be killed by iCloud and the Shuffle and Nano be morphed into wearable/iWatches? 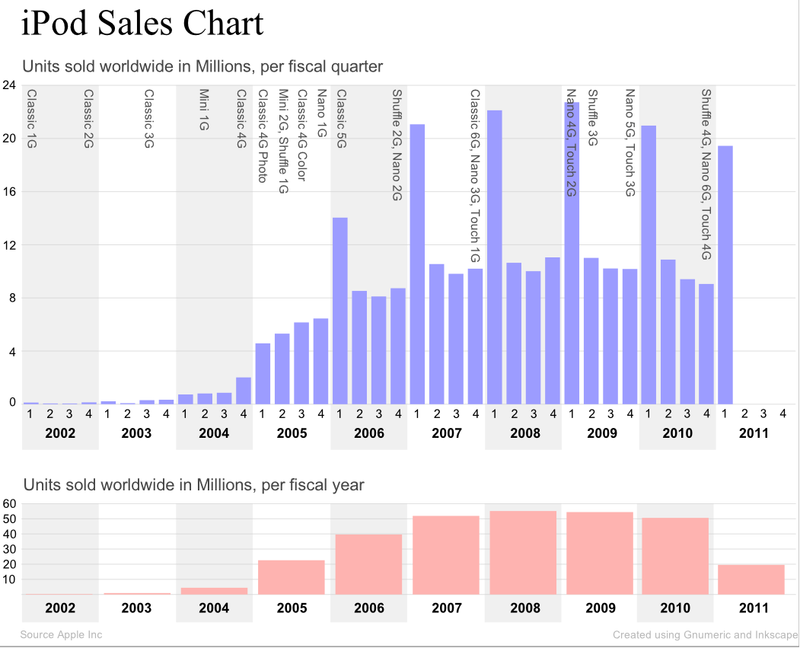 Out of Apple’s incredibly successful product lines, the iPods are the only one dropping numbers and revenue (above, mostly to iPhone and iPad, not the competition). Analysts as well as Apple forecast iPod sales drops close to 20% this quarter over the year ago quarter, which is an acceleration of the previous year to year drop. Apple’s very nature is to only go after lucrative expanding markets so there could be some motivation to cut or revamp the iPod lineup. One issue not often talked about the the iPod touch->iPhone transition: You’ll note that Apple designs its iOS products with combination 3G/GPS chips. So, whether it is an iPad or iPod, if it doesn’t have 3G, it doesn’t have real GPS. While Wifi or Cell-based Geo-location is helpful, it doesn’t give as accurate results in nearly as many places (or where there is no wireless). If Apple wants all of its mobile devices to have real GPS (which is becoming super-important for mobile), then it makes sense to throw in that 3G/GPS chip. At that point you have a 3G iPod touch…which is pretty much a cheap iPhone. On the other hand, there is a lot of innovation that could still happen in the iPod touch specific areas. The product could get a bigger screen like the rumored high end iPhone 5 and will almost certainly get a faster processor, Making it a gaming monster. IT could morph into a better camera making it a 1080P camera/point and shoot replacement. 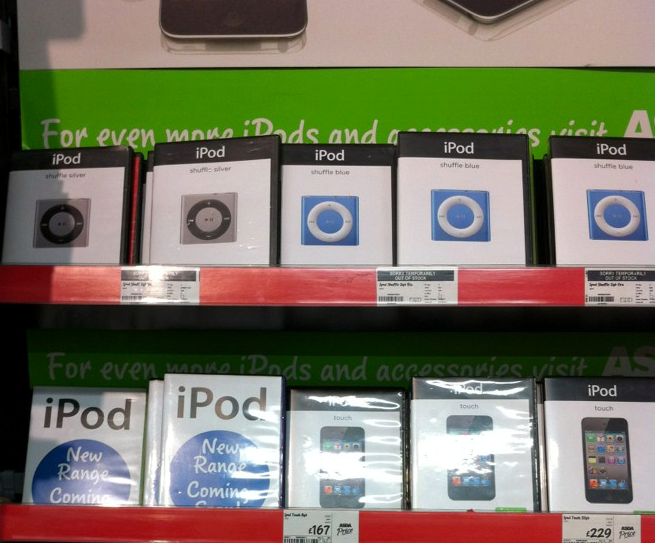 Perhaps more importantly, iPods could see a significant price drop, to $150 or below. A big price drop would open up Internet computing to a wider audience, especially in parts of the world where it takes months, not days or weeks, to save $150. I’ve always thought that $100 One Laptop per Child would be best exemplified in a small tablet or iPod type of device. Children have smaller fingers, better eyes, hold devices closer to their eyes and can carry iPods around easier than laptops. Compare a $200 iPod touch with the $200 OLPC – which one is better for kids in developing countries? The iPod Classic’s writing is on the wall. Literally-> . 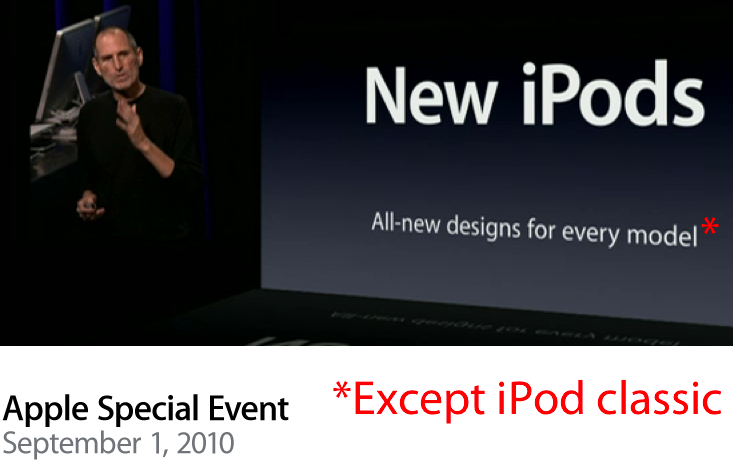 At the iPod event last year, Steve Jobs said that they were redesigning “every model” of iPod. Yet the iPod Classic didn’t even get a spec update (R&D=null). With the release of iCloud and Wifi synching, the Classic becomes even more of a relic. So the Classic is the easiest to do away with. Apple is probably just selling through last year’s stock at this point. The Shuffle’s strength is its price tag. You can get into Apple’s music ecosystem for just $49. However, with Apple rumored to be offering a low-priced iPhone that could end up free with a carrier subsidy, that’s pretty much a moot point. Especially since if you are an Apple user, you’ll likely have an iPhone. Also, a lower-priced Nano is what people who don’t want to lug an iPhone around really want. At $149-179, the current Nano is priced way too high (you can pick up a last generation iPod touch for the same price). Just like the current shuffle, the current Nano is probably not selling well (again, chart above). But Apple is just one generation into the new Nano OS and there is still significant potential there. Apple scrapped the Portal Player derived OS last year when it went to the pared down Touch-OS based Nano, but it also killed the ability to make and watch video among other significant cuts. This device isn’t really an iPod as much as it is a wearable controller. Even before it was launched, we knew people would be putting the nano on their wrists. Perhaps it is time for Apple to embrace the wrist wearing masses and to label this new iWear an ‘iWatch’? Thinner, bigger 3:2 screen and add Bluetooth while dropping to $99? How? Perhaps only by dropping the 8-16GB RAM requirements. So, will Apple kill the iPod next week? In my opinion, very unlikely. But if they did, that’s how it would go down.